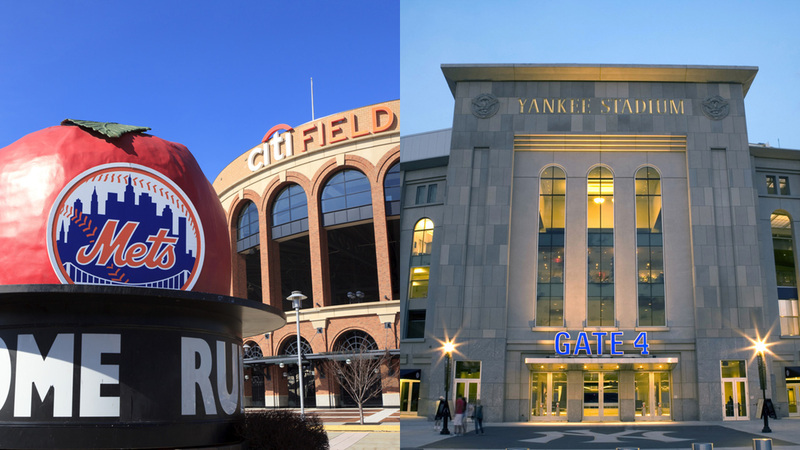 NEW YORK (WABC) -- New York is one of the few cities that is home to two Major League Baseball teams, and while the Yankees may have a huge lead in championships, it's the Mets who have a slight edge in fan support, according to a new poll. The Quinnipiac University New York Baseball poll found that 45 percent of New York City residents support the Amazins, besting the 43 percent who back the Bronx Bombers. Statewide, though, fans back the Yankees, 48 percent to 34 percent. The Yankees command a huge 53 percent-to-14-percent lead among upstate fans, with 9 percent rooting for the Boston Red Sox. Among suburban fans, 49 percent cheer for the Yankees compared to 44 percent who back the Mets. A total of 43 percent of New York state adults say they are "very interested" or "somewhat interested" in Major League Baseball. "When they're not following the Buffalo Bisons, the Syracuse Chiefs or the Tri-City ValleyCats, upstate baseball fans cheer for the New York Yankees," Quinnipiac University Poll assistant director Maurice Carroll said. "In the Big Apple, however, it looks like the 2017 baseball season will be a close race between the Yankees and the Mets." Quinnipiac surveyed 1,605 New York State adults from March 23 to 27, with a margin of error of +/- 2.5 percentage points. The survey includes 750 baseball fans, with a margin of error of +/- 3.6 percentage points. Live interviewers called landlines and cell phones. CLICK HERE for a deeper look at the results.